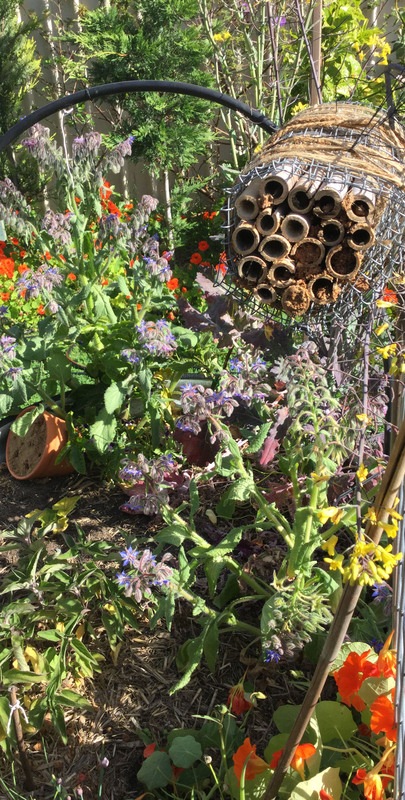 I’ve been keen to try building nest blocks for blue-banded bees, by packing a clay/sand mix into rectangular PVC pipe after hearing about this technique and seeing it online.I’ve looked at a few ideas for insect hotels and made a list of materials required. However, perhaps because of my recent sessions at Onkaparinga’s Living Smart sustainable living course, or starting my PDC, I’ve now crossed off the “buy rectangular PVC pipe” from my shopping list. 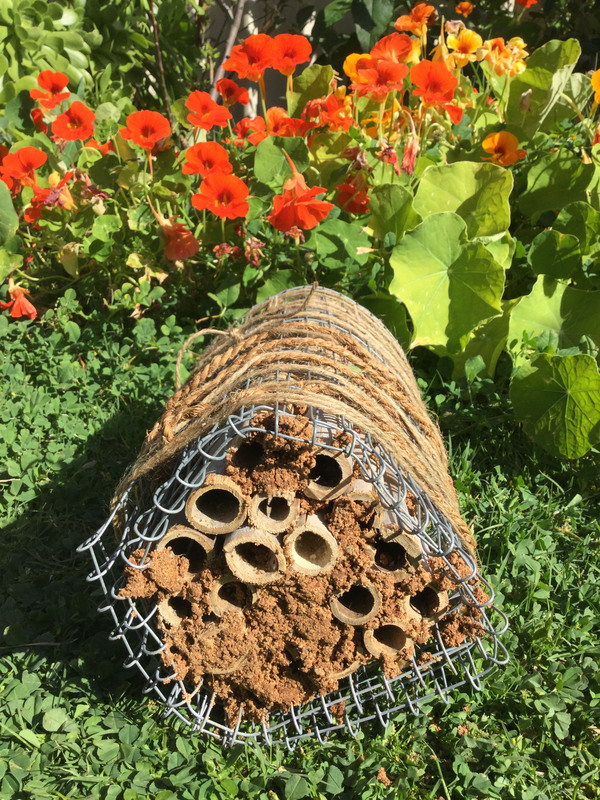 First, I’ll keep an eye out for some off-cuts and unwanted bits of PVC pipe found in serendiptious moments out and about so that I can give these wonderful nests blocks from the Australian Native Bee Research Centre a go at minimum investment. They really know what works for attracting native bees, so that’s my ideal to work towards. In the meantime, it’s Spring and bees need shelter. I used what I had in the spirit of experimenting with some ramshackle nests that I could probably call ‘ bee shacks’, and not quite bee hotels. For the less discerning bee, or indeed any insect interested in a small house footprint. Calling all bees and insects looking for a downshift! The way I look at is, the wider bee community and insects in general make do with what nature provides, rarely to a formula or straight lines or perfect build. So why not appeal to those opportunistic and adapatable personalities of nature , with my very own flavour of hacky haphazardness? So here is a combination of weathered bamboo garden stakes I already had, hessian, twine and some mesh that was a plant protector, packed with a clay and sand mix (clay soils from our front garden), that I then accidentally dropped from a height- removing most of the clay/soil. 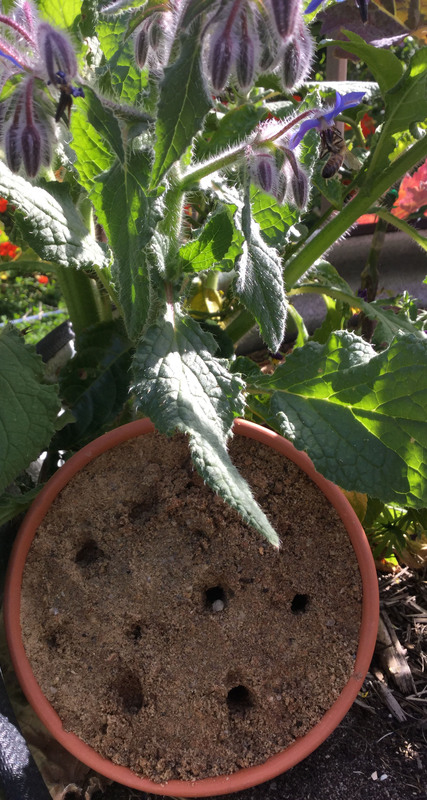 And also, an old pot packed with clay and sand, a few hints at what wandering insects might want to do to make a crash pad, and undaintily shoved on the soil underneath the borage. Now to see, who, if anyone, shelters in these tiny share shacks!